Alpaca fleece is quite different from sheep wool. In fact one would never call alpaca fleece wool. The construction of the alpaca fibre is very different from wool. 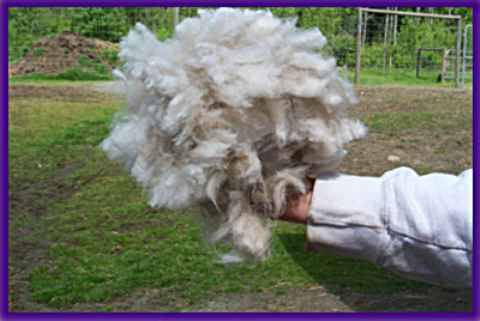 Alpaca fleece has two kinds of fibre, primary and secondary fibre. The fibre industry is looking for secondary fibre, as it is the finer of the two. As breeders we are trying to raise animals that produce mostly secondary fibre. Fibre diameter is not the only factor in the fibre character that is different from sheep wool. The scale construction on the outer layer of the fibre can make the fibre feel softer. 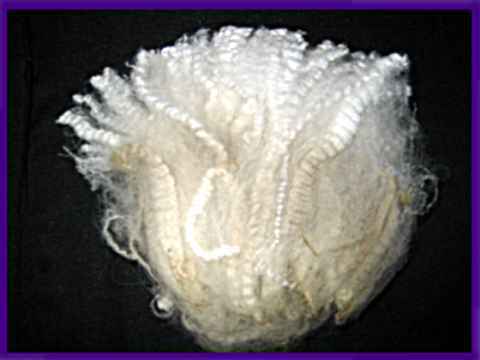 In sheep wool the scales stick out from the hair. The alpaca scale is much smoother and lays flatter and closer to the hair, thus increasing the comfort factor. The secondary alpaca fibre has air pockets in the center of the hair with large spacing between the cells, giving added insulation. The alpaca’s primary fibres are hollow and are much longer in length and have a fibre diameter of over 30 microns. Alpaca fibre is three times warmer than wool and seven times stronger and is one of the strongest natural fibres, if not the strongest. Alpaca fibre is as soft as Cashmere, but has a smoother cuticle that can make the fibre feel smoother. There are twenty-two recognized colors and two hundred different shades of alpaca fibre. The fibre is water resistant because of an alkaline substance on the out side of the fibre called "suint". The staple length of the fibre is from three to six inches in one year of growth. Alpacas should be given a feed that is designed for fibre growth. The protein level must be between 10-12 percent protein as protein levels can affect the thickness of the fibre diameter. There are two types of alpacas, the huacayas and the suri. The difference between their fibre is primarily the staple length and luster. The majority of alpaca fibre produced is huacaya as the suri is almost extinct in South America. It is believed the huacaya fibre is warmer than suri; hence the lower survival rate of suris in the high Andes Mountains of South America. North America has a larger suri population than South America. When looking for a well fleeced alpaca one would first look for uniformity in the fleece with the absence of primary fibres. Most alpacas will have some primary fibres on their chests, legs and under bellies. Run your hands over the animal feeling for softness with a nice feel to the fibre, called “handle”. In a healthy animal the fibre should be lustrous with a plush sheen along with a richness of color. Crimp is another good indicator of uniformity, fineness and elasticity, with the possible exception of darker colored animals. Some farms may have fibre analysis done, which can be used as guide to the fibre characteristics. Fibre diameters and modulations can change with the age of the animal, hormones, the seasons, feeding programs, the type of feed, and mineral imbalances in pastures. Fibre histograms should only used as a guide to the animal’s ability to produce fine fibre. Eighty percent of fibre characteristics are genetic. This is just one tool in the measurement of the fibre; also to be considered is the handle, the degree of softness displayed by the individual fleeces. These fibre statistics are from the Natural Fibre Centre and Testing Lab at Olds College, Olds, Alberta.